In December of 1995, the federal Food and Drug Administration (FDA) approved a drug called OxyContin, the first formulation of oxycodone that allowed dosing every 12 hours, rather than every 4-6 hours. This more highly concentrated version of the prescription painkiller was touted by its manufacturers to carry a lower risk of abuse or risk of addiction due to its supposed time-release nature. This patently false advertising led to a wave of prescriptions being written by health care providers coast to coast and brings us to where we are now with a nationwide opioid crisis and 2000 lawsuits currently underway against pain pill pushing Purdue Pharma. Though these suits could cripple the company financially, they will do little to discourage other major players whose potential profits far outweigh any payoffs or settlements that come along the way. To them, it’ll just be another cost of doing business solved simply by raising their prices a penny per pill. In the meantime, according to our own federal government, 130 people will die today in this country from an opioid overdose. Tomorrow, 130 more, and another 130 every day for our foreseeable future until real reform occurs. Unfortunately, unlike the unique nature of cannabis reform which was created from a grassroots movement from the bottom of society to the top, reform of Big Pharma will have to start at the top and some recent whistleblowing from inside the FDA has sent a signal that such a battle will not be easy to fight. Dr. Raeford Brown is a pediatric anesthesia specialist at the Kentucky Children’s Hospital, attached to the University of Kentucky. Doc Brown is also a chairman of the FDA’s Committee on Analgesics and Anesthetics in an advisory role that typically gives him major sway over drug approvals in this country. But after a recent approval was given for a drug called Dsuvia – an opioid compound 500x stronger than morphine – while Brown was on vacation, in an attempt to silence his criticism, he decided to get loud. “Congress is owned by pharma,” says Brown. While that may not seem like a huge revelation to those of us who have always kept a skeptical eye on politicians, it’s the first time that we’ve seen such a high ranking federal official say it out loud and Doc Brown has a grim diagnosis if we don't make major changes soon. A ton of money, indeed. . . just take a look at this screenshot from OpenSecrets.org showing the Top 20 federal lawmakers on the take from Big Pharma in both the Congress and the Senate. You may notice that 2nd on the list on the House side is Kevin McCarthy (R-CA) who raked in over $380k from pharma donors alone in the 2017-18 election cycle. McCarthy is a prominent Republican lawmaker now serving as the House Minority Leader – a powerful parking spot for Big Pharma dollars and a massive roadblock to any real chance at reforming or reining in these out of control companies. As Dr. Brown points out, Congress is supposed to oversee the FDA. The only way that the FDA and its approval process will ever become more accountable is if Congress slaps them with new rules or regulations but for a few million a year out of their couch cushions, they can ensure that lapdogs like McCarthy and the rest of the Reps and Dems on these lists kick the can down the road a bit further. . . while another 130 Americans die every day. Many headlines have been spun about the current crop of candidates hoping to unseat Trump in 2020 by riding a green wave of pro-cannabis talk all the way to the White House. One front runner in a field of born-again-pot-lovers is the Democratic Senator from New York, Kristin Gillibrand, who didn’t always like weed, until she did. As a new Congressperson, Gillibrand neglected to co-sponsor any pro-cannabis legislation brought forth by more progressive colleagues from her own party and she even went so far as to vote against an amendment aimed at protecting state-level cannabis programs from federal interference. 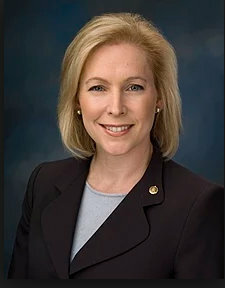 Now that the cannabis vote is a good vote, Sen. Gillibrand is totally down with the reefer, kids! Whatever political expediency caused her evolution is unknown but what matters is that pressure she felt from her left flank on the issue made her reconsider her stance and now she is championing several crucial cannabis bills including removing the plant from the Controlled Substances Act, allowing VA docs to discuss cannabis with their patients, and whatta ya know she’s now even co-sponsoring a bill to protect state-level cannabis programs from federal interference. Talk about an about-face! Yet, there she is, #11 of the Top 20 Senators on the take from Big Pharma. Apparently, her image makeover team is on it because Sen. Gillibrand is now targeting this major financial backer with rehashed legislation that would “penalize pharmaceutical companies believed to be engaging in price gouging without cause”. Under current law, pharmaceutical companies can raise the price of their products without any need to provide any justification whatsoever. Gillibrand’s push back would, in theory, keep prices from rising as quickly. But is that the answer to the opioid epidemic, cheaper prescription drugs? It is not too late for Senator Gillibrand or any of the other lawmakers on those Top 20 lists to change course on regulating Big Pharma, but how do we motivate them? The reality is, it’s nearly impossible to compete with that lobby dollar for dollar. But we can identify anyone in office and/or running for office who is on the take from Big Pharma and is trying to take shelter in the popularity of cannabis reform, and make them answer some hard questions and provide some real answers every chance that we get.